VC Brian Schmidt announced on Friday that ANU has withdrawn from talks with the Ramsay Centre over the proposed Western Civilisation degree. Schmidt cited a conflict between the university’s autonomy and the “sponsored program” that he believes the Ramsay Centre wanted. 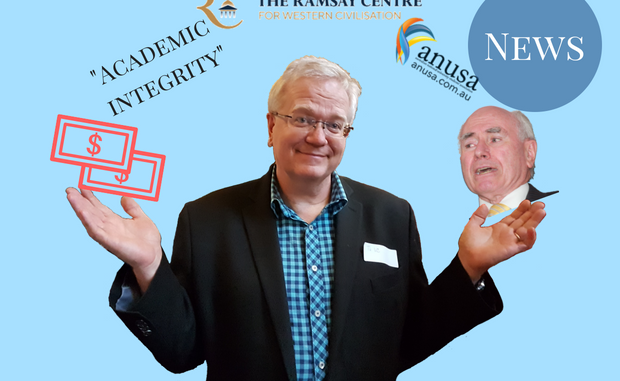 Schmidt stated in his blog on Friday that negotiations between the ANU and the Centre were approached “with a positive and open spirit”, but that, ultimately, the university could not approve and endorse a “sponsored program” like the one sought by the Ramsay Centre. Schmidt had previously reassured the ANU community that the ANU would not accept any funding if the collaboration did not meet the University’s “core set of principles” being “academic integrity, autonomy, and freedom”. The Dean of CASS, Rae Frances, expressed similar sentiments in response to concerns from the student body. The decision was met with disappointment from the Federal Government, with Education Minister Simon Birmingham condemning the “ill-informed or politically correct objections” that led to the withdrawal. Birmingham said that it was “essential” that universities be “enthusiastic” about the study of the values that helped to create modern society. The National Tertiary Education Union has celebrated ANU’s decision, however, as a victory for academic principles over financial and political pressure. ACT Branch Manager Matthew King condemned the degree in a letter to Schmidt last month, expressing “grave concerns” of the potential backlash, should the degree compromise the university’s core principles. ANUSA and PARSA similarly “welcome[d]” the decision, praising the decision to “prioritise academic autonomy over external sponsorship”. The associations used to opportunity to spotlight the need for more sustainable funding for higher education, so that private donors could not compromise educational autonomy. The University announced it was in negotiations with the Ramsay Centre in December. It announced further plans for the degree and an associated scholarship in March, and had a week for student feedback. The negotiations were brought into the spotlight again at the end of May, when The Australian and other media covered the program. The head of the ACT branch of the National Tertiary Education Union wrote a letter to ANU last month, warning of backlash if the University’s autonomy was compromised. A number of Liberal and National MPs came out in support of the plans, and were critical of resistance from staff and students. Former Prime Minister and Chairman of the Ramsay Centre Board, John Howard, vehemently disagreed with Schmidt’s assessment of the degree as a “sponsored program”. In a letter to Schmidt published by The Australian, Howard stated that the withdrawal was “intensely disappointing”. He noted that, although “differences of approach” were emerging between the ANU and the Ramsay Centre, the two institutions had come to an understanding of how to address them. He also reiterated the Centre’s endorsement of the principles of academic integrity. In an article for Quadrant last month, Tony Abbott – another member of the Ramsay Centre Board – claimed that the agreement between the two parties was close to being finalised. In that same article, Abbot claimed that “a management committee including the Ramsay CEO and also its academic director will make staffing and curriculum decisions” for the degree. The CEO of the Ramsay Centre, Simon Haines, has previously stated that “If [the Centre] feels like it’s not going to go to appreciation of Western Civilisation, then we can withdraw the funding”. There was no mention of ANU’s input on the degree in either case. The last meetings between ANU and the Ramsay Centre had focused on the curriculum for the proposed degree, according to the correspondence between Howard and Schmidt. Schmidt argues in his letter, though, that the two institutions were “not even halfway towards reaching an agreement”. According to the correspondence, the Ramsay Centre’s initial proposal for a curriculum had been rejected by the University, amid concerns it would not pass the Academic Board. ANU planned to formulate a curriculum of its own for the Centre’s approval. The proposed Bachelor of Western Civilisation was to be offered from Semester 1 next year. It would focus on a ‘Socratic’ learning style, interrogating the ‘great works’ of the western canon. Classes would be capped at between seven and ten students, with the course itself comprising around 60 students total. The Ramsay Centre was also to provide 30 scholarships of approximately $25,000 per year, with additional scholarships available for international travel. The Ramsay Centre has stated that they are currently in discussions with other universities to offer the degree.